Proton-Pump Inhibitors Pharmacology | All the Facts in One Place! Proton-pump inhibitors are one of the most widely prescribed gastrointestinal drug classes. They are used in the treatment of conditions caused by an excess in gastric acid production. For example – proton-pump inhibitors are used in the treatment of peptic ulcer disease, NSAID-associated ulcers, GERD and the eradication of H. pylori infection. PPIs work through the irreversible inhibition of the proton pump – a pump found on gastric parietal cells. PPIs can be identified through the suffix –prazole. In the case of H. pylori infection, proton-pump inhibitors are used in combination with other drugs, such as antibacterial drugs (typically two drugs). With these indications in mind, let’s learn how precisely proton-pump inhibitors work; how they reduce stomach acid production. Proton-pump inhibitors reduce stomach acid production through irreversible inhibition of the proton pump – the H+/K+-ATPase, a pump present in gastric parietal cells. In this way, proton-pump inhibitors differ from H2 receptor antagonists (for example – ranitidine). That’s because proton-pump inhibitors bind to the terminal phase of stomach acid production, whereas H2 receptor antagonists do not. This makes proton-pump inhibitors far more effective at reducing gastric acid production. However, because PPIs inhibit gastric acid production to a high degree, they also come with physiological consequences. Notably, the mechanism of PPIs comes with metabolic consequences. For example – stomach acid is necessary for digestion of nutrients – such as vitamin B12, proteins and calcium. When stomach acid production falls too low, this leads to a state known as achlorhydria. PPIs may also mask the symptoms of gastric cancer. Patients should be monitored for alarm symptoms, such as difficulty swallowing and weight loss. There is tentative evidence that, when PPIs are administered to the elderly for prolonged periods, that it increases the risk of fractures. That for H. pylori infections, PPIs are combined with other medicines. It’s not uncommon for patients to take a PPI alongside two antibacterial drugs – such as clarithromycin (a macrolide) and amoxicillin (a penicillin). Given that PPIs can mask the presence of gastric cancer – patients should report alarm symptoms such as weight loss and difficulty swallowing. That when PPIs are administered over the long-term, they increase the risk of hypomagnesemia – symptoms of which include tremors, seizures and cardiac arrhythmias. Patients may then be switched to a H2 antagonist. Omeprazole interacts with clopidogrel, an antiplatelet drug. It decreases activation of clopidogrel. By reducing the antiplatelet effect of clopidogrel, omeprazole may increase the risk of stroke and heart attack. That by increasing gastric pH, PPIs increase the risk of Clostridium difficile infection. Hydrochloric acid is often necessary to destroy harmful microorganisms that enter the gastric orbit. PPIs also increase the risk of other bacterial infections such as peritonitis – particularly if the patient has co-morbid conditions such as irritable bowel syndrome. That PPIs are classified as pregnancy category C – meaning that “risk is not ruled out”. That PPIs are typically administered in the morning, one hour before food. It typically takes several days before a definite therapeutic effect takes hold. Proton-pump inhibitors have been around since the 1980s – the first PPI, omeprazole, being released in 1988. Since then, PPIs have consistently remained a highly effective choice at reducing gastric acid production. As they inhibit the terminal phase in stomach acid production and because they remain very well tolerated, PPIs will continue to remain an important drug class in the clinician’s toolkit. 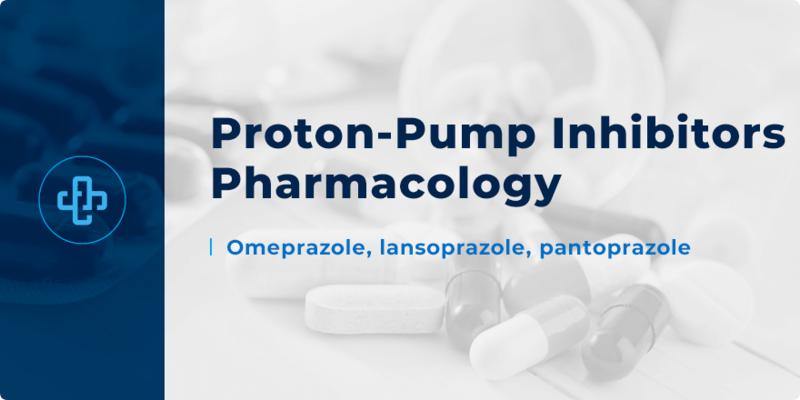 Want to learn more about proton-pump inhibitors pharmacology? Register with PharmaFactz today to gain instant access to all the resources you need. In the meantime, take a few seconds to join our pharmacy blog newsletter (above) to receive all the latest facts direct to your email!